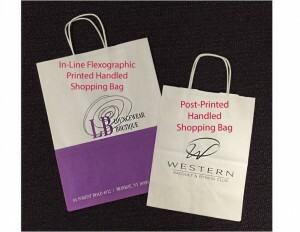 Choosing the Right Printed Bag for Your Business | Wisconsin Converting, Inc.
You may not give it much thought, but there are actually several different ways to print a logo or promotional message on a paper bag. It can be frustrating for those without knowledge of bag manufacturing and printing to understand what can and cannot be printed on their packaging. Different printing methods have their own set of specifications and capabilities. Our resident manufacturing expert, Doug Frye, has been with WCI for nearly 30 years and is sharing his expertise to explain the differences. “Each printing method has its own features, benefits, and requirements,” Frye says. “And each creates a solution that suits different types of businesses and their budgets.” For example, a small business may be looking to purchase just one case of a simple design for their growing business, while large retailers might have a large-volume project with complex screening and larger graphics. WCI is a paper converting company. We employ three different methods of custom printing for large and small quantities for customers nationwide. Each provides a solution that’s ideal for different types of customers. In-line flexographic printing. Flexography is commonly used for printing in a large quantity, high-speed manner on flexible materials including paper bags, disposable cups, envelopes, labels, newspapers, and more. Flexographic printing utilizes fast-drying inks and flexible printing plates made of rubber or photopolymer (plastic). Plates are made with a raised image, similar to a rubber stamp, and are mounted on cylinders that rotate and transfer the image (customer logo, graphics, etc.) onto the substrate (paper). One plate is needed per color, as they are printed separately. This is important to consider when discussing multi-color graphics as the registration (or vertical placement of the graphics on the substrate) can vary in flexographic printing. According to Frye, “When designing multi-color graphics for flexographic printing, it’s important to take registration into account so the customer is happy with the end result.” For small businesses, or those without access to a graphic designer, our in-house graphics department is happy to make specific recommendations. At WCI, paper bags are printed with water-based (water soluble) inks in up to four spot PMS colors during manufacturing on the machine. Large paper rolls are mounted at the beginning of the machine. The paper unwinds from the roll, runs through the machine where it is formed, folded, glued and cut off to form a bag. During that time the presses can imprint customers’ promotional message or logo. In-line flexographic printing is best suited for large-run printing, typically 5,000 bags or more. This method of printing allows for high-speed printing, allowing volume price breaks and a larger print area. Don’t need 5,000 bags? No problem! 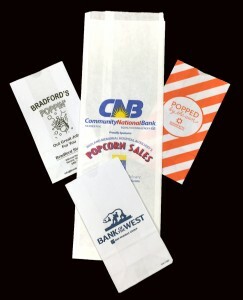 Small businesses, wedding planners and promotional companies can take advantage of the small-quantity options available with post printed bags. Unlike in-line flexographic printing where an entire machine is set up to run a particular bag size and requires longer runs, a post-printing machine is easily adjusted to imprint an image or logo on an already manufactured bag, which means you can order quantities as low as 200 bags, depending on bag size. This is a fantastic option for special events, home-based businesses, and companies that don’t have enough storage space for pallets of bags. They can order a minimal quantity and avoid large minimums orders and huge overall costs. There are limitations, however, to where graphics can be printed on the bag because seams and gussets need to be avoided. Print areas differ when printing in-line or post-printing but both provide a high-quality customized bag. Customers looking to order fewer than 5,000 bags can still have high-quality, custom printed bags with their logo or promotional message. Designing graphics can be a bit trickier for this method of printing, but there are plenty of benefits including cost, minimums, and lead time that make post-printed bags a viable solution. 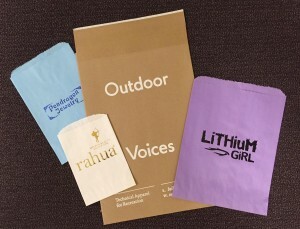 For customers seeking specialty packaging with an upscale appearance, hot stamped bags are a brilliant option. Appreciated for their expensive look, bags with hot stamped logos are popular with jewelry stores, wineries, and boutiques – and are often used for weddings and special events looking to “wow” their guests. The result is that the customer logo has a glossy, very opaque appearance, even on dark-colored bags. 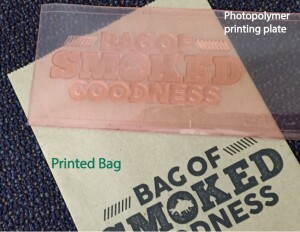 Like post printing, the foil stamp is applied to bags that are already manufactured. Again, that means print area will be affected by handles, seams, and gussets. Hot stamped bags are slightly more expensive than their ink-printed counterparts, but for businesses looking for a truly unique and elegant way to brand their packaging it is worth the additional cost to impress their patrons. 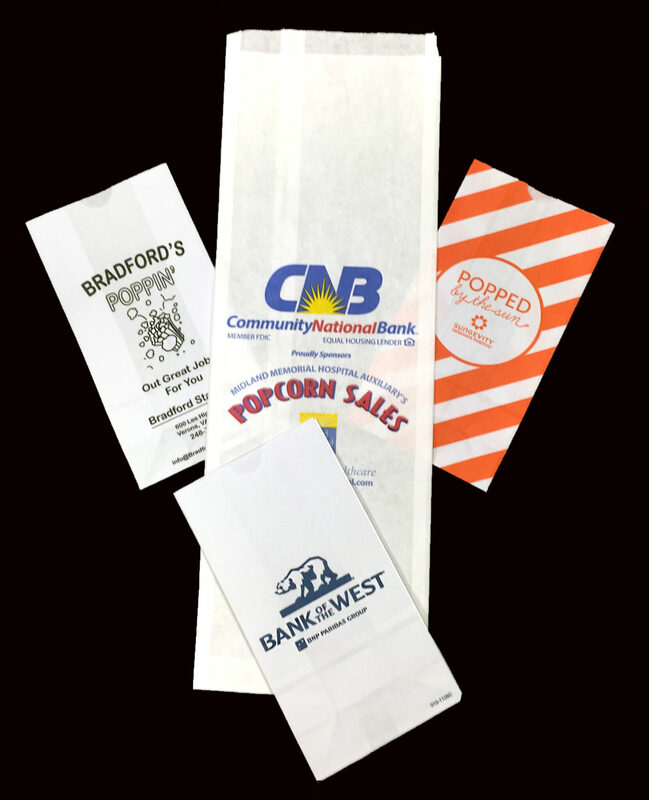 Wisconsin Converting, Inc. can offer many different options to help achieve quality personalized bags without sacking your budget. Call today for help ordering your custom printed paper bags – our packaging experts can help guide you through the process. Click here to see printing templates for design purposes.